Original astronaut Scott Carpenter, as seen in 1962 wearing his Mercury spacesuit, died Oct. 10, 2013. The United States' fourth astronaut to fly in space and the second to orbit the Earth, Scott Carpenter, 88, died on Thursday (Oct. 10) after suffering a recent stroke. Carpenter passed at 5:30 a.m. MDT (7:30 a.m. EDT; 1130 GMT) with his wife Patty at his side, his family confirmed to collectSPACE.com. "Today, the world mourns the passing of Scott Carpenter," NASA Administrator Charles Bolden said. "As one of the original Mercury 7 astronauts, he was in the first vanguard of our space program — the pioneers who set the tone for our nation's pioneering efforts beyond Earth." "His accomplishments truly helped our nation progress in space from the earliest days to the world leadership we enjoy today," Bolden said. "We will miss his passion, his talent and his lifelong commitment to exploration." Chosen in 1959 among NASA's first astronauts, Carpenter made his first and only spaceflight on May 24, 1962, when he became the sixth man worldwide to leave the planet. During his Mercury-Atlas 7 mission, Carpenter circled the Earth three times, conducted some of the first astronaut science experiments, and consumed the first solid space food — small square cubes composed of chocolate, figs, and dates mixed with high-protein cereals. "You have to realize my experience with zero-g, although transcending and more fun than I can tell you about, was, in the light of current space flight accomplishments, very brief," Carpenter said in 1999 during a NASA oral history interview. "The zero-g sensation and the visual sensation of space flight are transcending experiences, and I wish everybody could have them." "I had the record for overshooting the target for a long time until some cosmonauts came along some years later and missed theirs by 1,500 miles," Carpenter said. Carpenter never flew in space again, the result of an injury to his left arm sustained in a motorcycle accident in 1964. He did however, become an aquanaut, spending a record 30 days on the ocean floor aboard the Navy's SEALAB II, an experimental habitat located off the coast of California. Besides his own space and sea adventures, Carpenter is popularly remembered for his radio call "Godspeed, John Glenn," which heralded his fellow Mercury astronaut's lift off to become the first American in orbit on Feb. 20, 1962. With Carpenter's passing, Glenn is the last of the Mercury 7 astronauts alive today. Malcolm Scott Carpenter was born in Boulder, Colorado, on May 1, 1925, to Dr. Marion Scott Carpenter, a research chemist, and Florence (Noxon) Carpenter. He attended the University of Colorado, where he received his bachelor of science degree in aeronautical engineering in 1949. Commissioned in the Navy in 1949, Scott Carpenter underwent flight training in Pensacola, Fla. and Corpus Christi, Texas before becoming a Naval Aviator in April 1951. During the Korean War, Carpenter served with patrol Squadron Six, flying anti-submarine, ship surveillance, and aerial mining, and ferret missions in the Yellow Sea, South China Sea, and the Formosa Straits. After the war and attending the Navy Test Pilot School at Patuxent River, Maryland, Carpenter was assigned to the electronics test division of the Naval Air Test Center, also at Patuxent. In that assignment, he test flew every type of naval aircraft including multi and single-engine jet fighters, propeller-powered fighters, attack planes, patrol bombers, transports and seaplanes. From 1957 to 1959, Carpenter attended the Navy General Line School and the Navy Air Intelligence School and was then assigned as an air intelligence officer to USS Hornet aircraft carrier. Carpenter was serving on the Hornet when he received secret orders to report to Washington for what he soon learned was NASA's recruitment effort for Project Mercury astronauts. Following his Aurora 7 spaceflight and participation in the Navy's Man-in-Sea Project, Carpenter served as executive assistant to the director of the Manned Spacecraft Center (today, Johnson Space Center in Houston) and was active in designing the Apollo lunar module, as well as advancing the use of underwater training for spacewalks. He left NASA in 1967, and spent two more years with the Navy's Deep Submergence Systems Project, prior to his retirement from public service. Carpenter then established and led Sea Sciences, a venture capital corporation aimed at enhancing the use of ocean resources while improving the health of the planet. In pursuit of these goals, he dove in most of the world's oceans, including the Arctic. Scott Carpenter, the second U.S. astronaut to orbit the Earth, as seen at NASA's Kennedy Space Center in 2011. Later as a consultant, Carpenter contributed to improving diving instruments, including breathing devices, swimmer propulsion units and small submersibles. 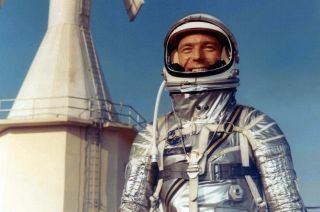 A recipient of the National Aeronautic Association's Collier Trophy, a member of the Astronaut Hall of Fame and a co-founder of the Mercury 7 Foundation (today the Astronaut Scholarship Foundation), Carpenter told of his "uncommon journey" to become a Mercury astronaut in "For Spacious Skies," his 2003 autobiography penned with his daughter Kristen Stoever. He also wrote the "underwater techno-thriller" novels "The Steel Albatross" in 1991 and "Deep Flight" in 1994. Carpenter is survived by his wife Patty Barrett and seven children, four from his first marriage, two from his second marriage and one from his third. He is also survived by two stepchildren, a granddaughter and five step-grandchildren. This story was updated at 5:20 p.m. ET to include new comments from NASA Administrator Charles Bolden.